This is my second opera of Vincenzo Bellini. The first was I Capueleti e I Montecchi (The Capulets and the Montague’s), presented by Opera Australia last year and in the chronological journey of the composer’s output, La Sonnambula is the direct follow up. First performed on the 6th March, 1831 at the Teatro Carcano, Milan. The story is based on a ballet by Scribe and concerns the sleepwalking of a young betrothed girl, Amina (Lorina Gore), who in one of her walks , just before her wedding day, arrives in the bedroom at an inn, where the Count Rodolfo (Stephen Bennett) is in residence. Gallantly, without waking her, the Count puts her to bed and leaves. Unfortunately a scheming rival to Amina, Lisa (Amy Wilkinson), finds her and reports it to the community and the jealous Elvino (Aldo Di Toro), a wealthy landowner and the affianced gentleman, emotionally breaks up the wedding plans and proposes to another. Scandal. It does, you will be pleased to read, end happily for Amina - if marrying an emotionally shallow ‘infant’ behoves happiness. It is, after all, an opera of the Romantic period. If you attend this opera for a good story than this is not for you. This story utterly belongs to its period and is more than silly. No production, postmodern or otherwise (!!) would make it believable. 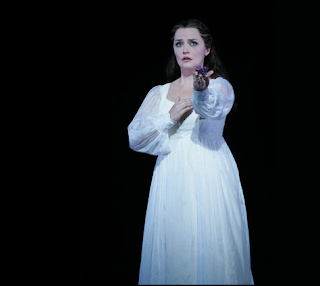 The recent broadcast production from the Metropolitan Opera in New York valiantly tried to make it work. The Setting by Richard Roberts is an attractive wooden slatted box, painted with a “chocolate box” pattern that represents a mountain-scape in Switzerland. Centre stage is a raked floor-boarded square that revolves, around and, tiresomely, around. Furniture is put and taken off the square, for the different locations. The walls of the box can retreat into the wings and we can, variously, see a vision of candles in the first act and for the last act a large representation of the local mill wheel, in this case, attractively spinning.. It is an attractive design. The costumes also by Mr Roberts are ‘period’ (transposed to 1900s) and are pretty opera costumes. Unfortunately, Mr Roberts is not blessed with a consistently clever Lighting Designer (Matt Scott) and a preponderance of distracting shadows are evident most of the time on the walls of the set and even on the proscenium arch of the stage. There is no logic to the lighting plot either and one finally surrenders to the conclusion that the theatrical picture atmospherics, when they are achieved, sometimes, is enough. There were, indeed, some very pretty pictures. These choices, one presumes, were part of the Director’s aesthetic (Julie Edwardson). What Ms Edwardson has managed to do is move her cast, chorus and all, around the space. It is a very busy traffic (The revolve, as well, does spin and spin, did I mention that?). What Ms Edwardson has not managed, at all, is to guide or motivate her principals and chorus into any sense of attempting to act the roles except in an archaic pencil thin superficiality. For example, the communicative arsenal of jealousy that Mr Aldo Di Toro has access to is extremely limited and in the end, woefully amusing. Some advice or psychological guidance may have helped the performer. Most of the singers have the good grace or sense to simply walk about and stand to the front and sing with feeling. A contemporary audience that is not a regular opera goer might find the style of the acting under the behest of this director, risible and very off putting. However, the real reason to attend this opera at all is to hear the singing and enjoy the music. La Sonnambula was an enormous success in its day and has been part of the repertoire of the world’s opera houses in recent times, principally because Richard Bonynge championed it to service the wonderful miracle of the voice of Joan Sutherland. Listen to the recordings and you will grasp the spectacle of the great potential of Bellini as a transporting experience. Mr Bonynge, too, has prepared, musically, this production, although at this performance (Monday, August 9th) it was conducted by Anthony Legge. Also, the role of Amina was sung by Lorina Gore and not Emma Matthews, the bill boarded star. The singing by Ms Gore was very impressive and demonstrated the value of the opportunity to hear this score in the theatre. The beauty of the writing of Bellini was transfixing and Ms Gore , mostly, had one enthralled with a kind of awe of the athletic requirements of this kind of repertoire, combined with a passion of feeling in the singing. Stephen Bennett was also impressive as also, in a smaller role, was Andrew Jones (Alessio). Amy Wilkinson did not seem quite as comfortable. Mr Di Toro sang well but not necessarily as expressively as might be possible. Not much theatre. Not much drama. But beautiful singing and music. Know why you are going and a very rewarding evening can be had.